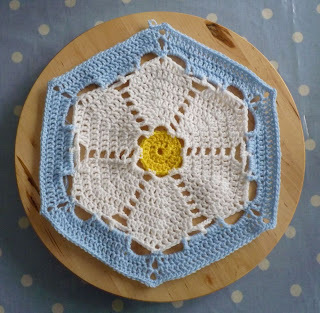 Oooh, I want to make lots and lots of these motifs, just to see what they look like in different colours. 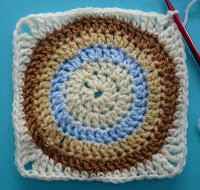 I won't buy yarn - no, no, no, I won't, I have to use my scraps - but there are so many possibilities. I'm still tweaking the pattern before putting pen to paper. This is going to very pregnancy-heavy, so feel free to skip it if you wish. 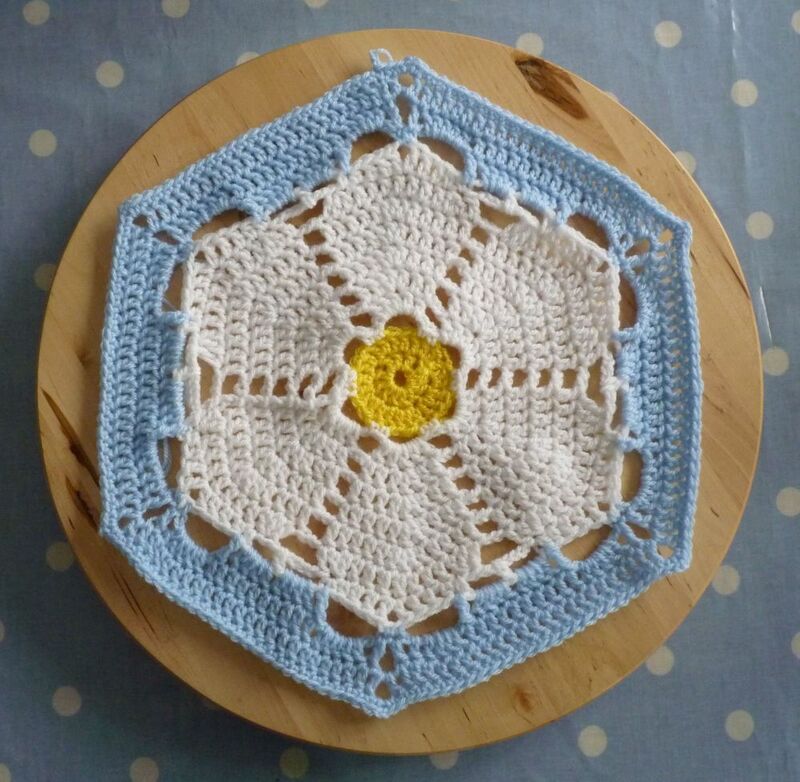 I have some crochet pictures to share tomorrow or Tuesday, so call back then if you're child-free, child-uninterested or just plain sick of tales of bumpiness. 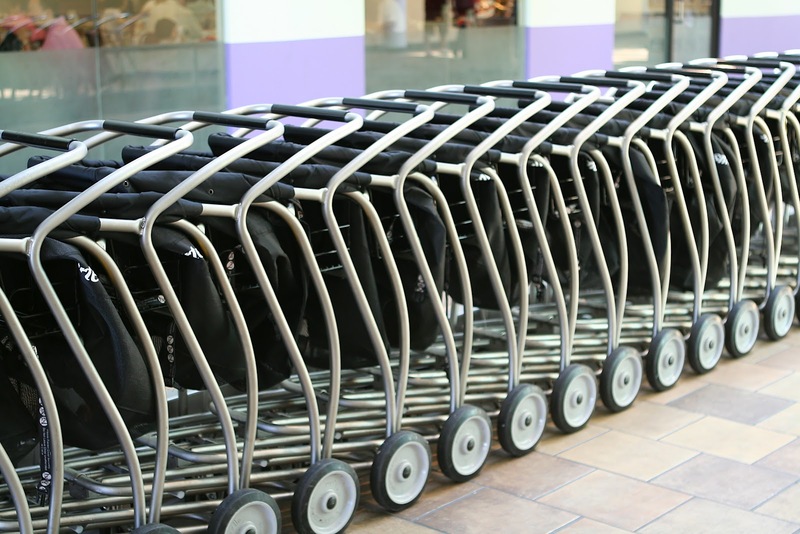 You probably don't know this, but there are inter-cultural differences between German and Irish airport luggage trolleys (or baggage carts - see, even the terminology differs from place to place!) 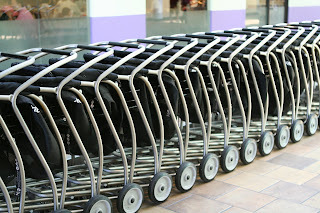 German luggage trolleys are in a permanent state of braking: in order to move the trolley, you have to press a lever and the trolley allows itself to roll. If, say, distracted by something shiny in an airport shop, you happen to release the lever, you'll find yourself wrapped around your suitcases, your trolley glued to the floor by the incontrovertible staying power of a set of German brakes. Irish trolleys, on the other hand, can be braked by pressing down on the lever; the rest of the time, they are free to roll about as they please - if the building tipped sideways or someone gave them a careless push. ... but I now have "suspected gestational diabetes", which means that I don't actually have diabetes, but it is maybe - possibly - slumbering inside me, waiting to be unleashed by a slice of chocolate cake or a good nosh-up at MacDonald's. I am a German luggage trolley with a permanent brake on: we will prevent disaster by expecting the worst. Adieu, Black Forest Gateau - come October, I'll wrap my lips around your chocolatey goodness with impunity. This week also had a more pleasant pregnancy experience: we got to see a 3D scan of the Gingerbread Baby to check that all of his organs were as they should be and where they should be. Our doctor even gave us a photo of his little face, hand bunched up under his chin. Now, let me be honest with you: these photos are generally quite creepy. The baby is inside you - yes, dwell on that for a minute: in your interior - and something akin to a hightech supermarket scanner takes a photo of its face. Very often, the babies look like little aliens or something from a horror film. Except my child. My child is a stunner. "He looks gorgeous," I pronounced, with all the certainty of a hormonal spike. "That baby looks just beautiful." There was a diplomatic silence from my husband at my side. The doctor made non-committal murmury noises: she was more concerned with making sure it had kidneys and a liver. "Seriously," I said, in the direction of the not-adoring-enough father-to-be, "Isn't he lovely?" "Don't say it!" I hissed, "That. Is. Your. Child!" I can't say for sure because I was too busy fixing my husband with a gimlet stare, but there might have been some eye-contact between doctor and father, and wisely, he shut up. But let me tell you, readers, my baby looks amazing - far more handsome than any other baby I've ever seen. Never before has there been a more beautiful child. And that is my unbiased, impartial and totally objective opinion. So ... what have I been up to? 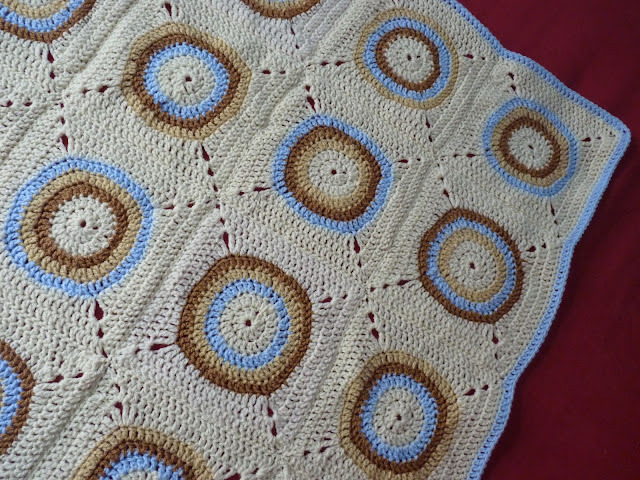 I finished a blanket for a friend of mine, Lisa, who's expecting a baby. 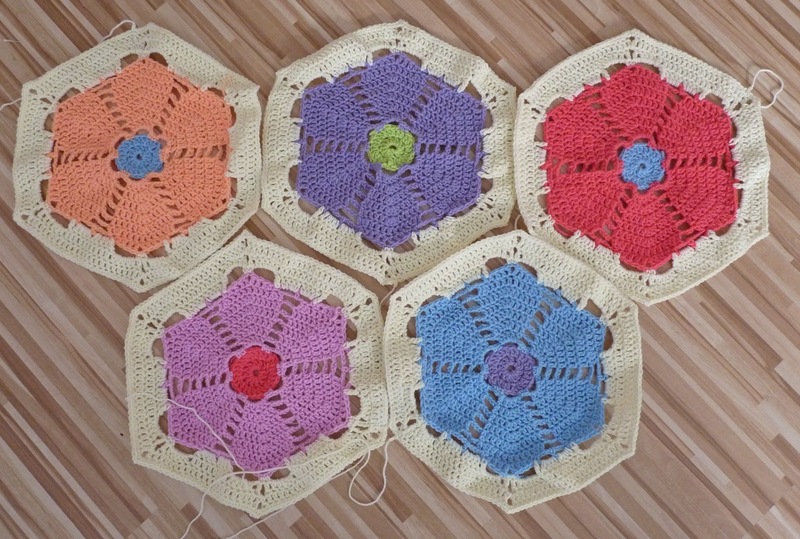 I used Krochet Krystal's daisy square pattern, which I really like because it has the potential to use up so many different yarn colours. This blanket coincided with me getting my hands on a skein of black worsted weight yarn, which means that I can finally fulfil my obligations and make a daisy square for Krystal in "payment" for the pattern. I've also designed a new motif. 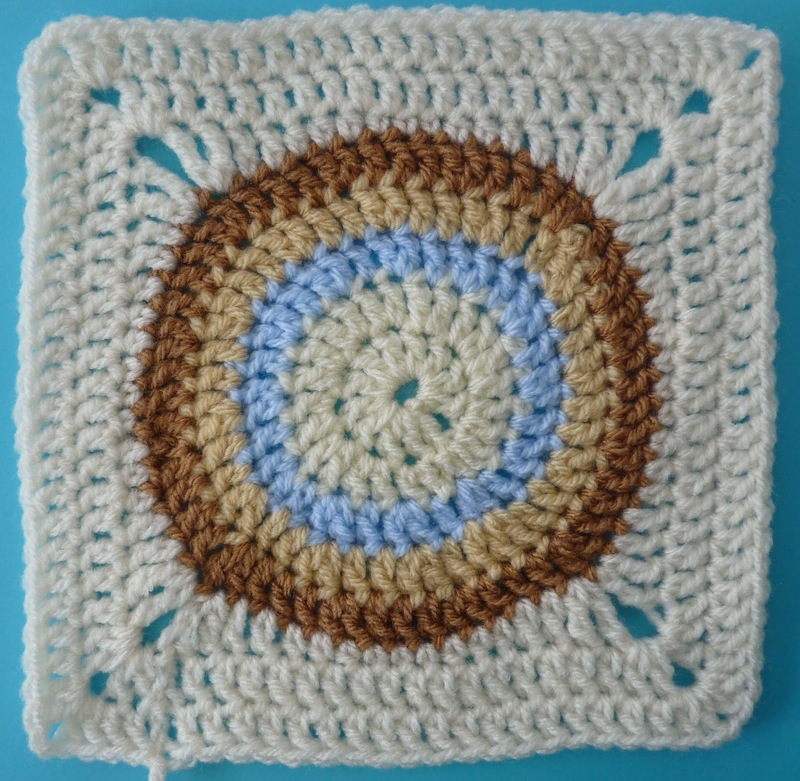 This is actually a motif that I'd had in mind for about a year: I think I remember seeing a black-and-white photo in a 70s crochet book of something similar, but like many half-memories, I don't even know if I really have seen something like this or whether I dreamt it. In any case, I tried again and again but it didn't work: I just I knew I could do it, I just couldn't figure out how. Suddenly, two nights ago, it clicked, and as though I were inspired, it just ... worked. Now all I have to do is make 30+ more, sew them together and see if the motif works as an afghan. 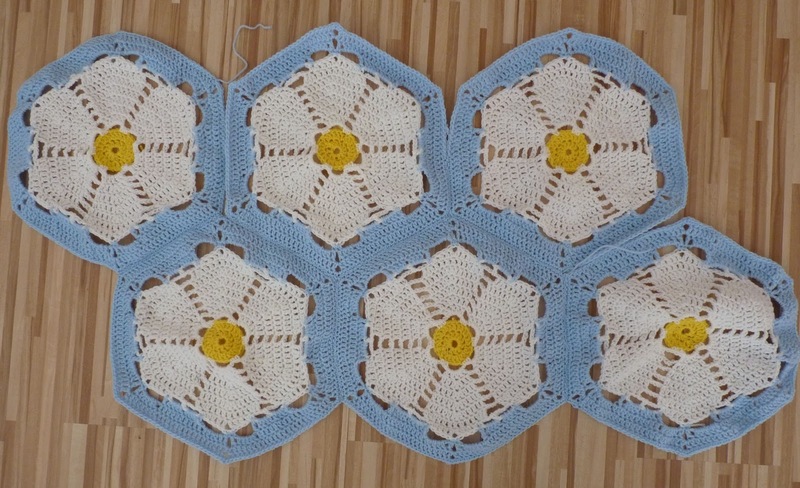 Then I'll do the same thing again, but with the motifs in different colours and then again with all of the motifs in a single colour, and then I'll write up the pattern. Gulp. This is a simple square - or, to be more precise, a circle in a square. 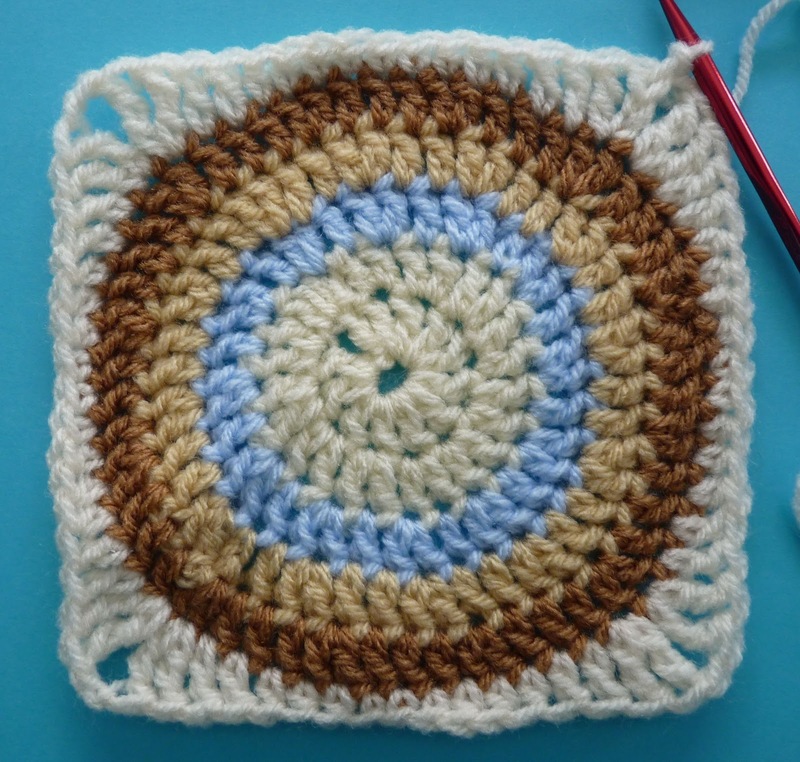 I've chosen to do mine with a restricted palette - cream as the main colour and three bands of colour (cream, cappuccino and sky blue) around the circle. Chain 4. 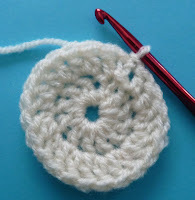 Join with a sl st to form a loop. Round 2: Chain 3, 1 DC [TR] in same st. 2 DC [TR] in each st in the round. Join with sl st to top of ch 3. Ch 1, yank tight, cut yarn and weave in end. 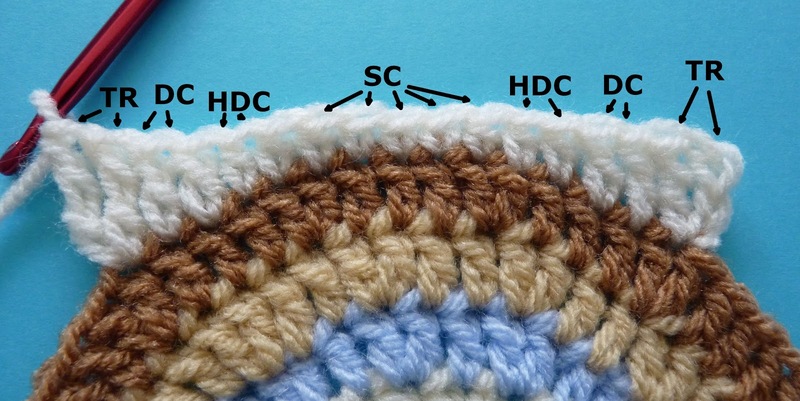 (Stitch count: 24 DC [TR] ). Round 3: 1 ch, 1 DC [TR] in same stitch, *2 DC [TR] in next stitch, 1 DC [TR] in next stitch. Repeat from * around, ending with 2 DC [TR]. 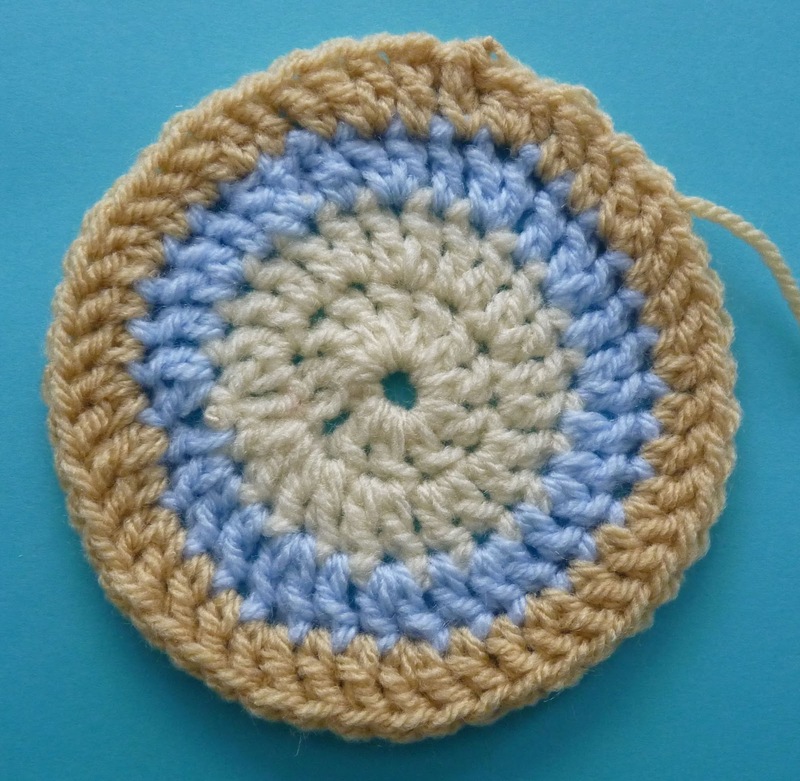 Join with slip stitch. Round 4: 1 ch, 1 DC [TR] in same stitch and 1 DC [TR] in next stitch, *2 DC [TR] in next stitch, 1 DC [TR] in next two stitches. Repeat from * around, ending with 2 DC [TR]. Join with slip stitch. Round 5: 1 ch, 1 DC [TR] in same stitch and 1 DC [TR] in next two stitches, *2 DC [TR] in next stitch, 1 DC [TR] in next three stitches. Repeat from * around, ending with 2 DC [TR]. 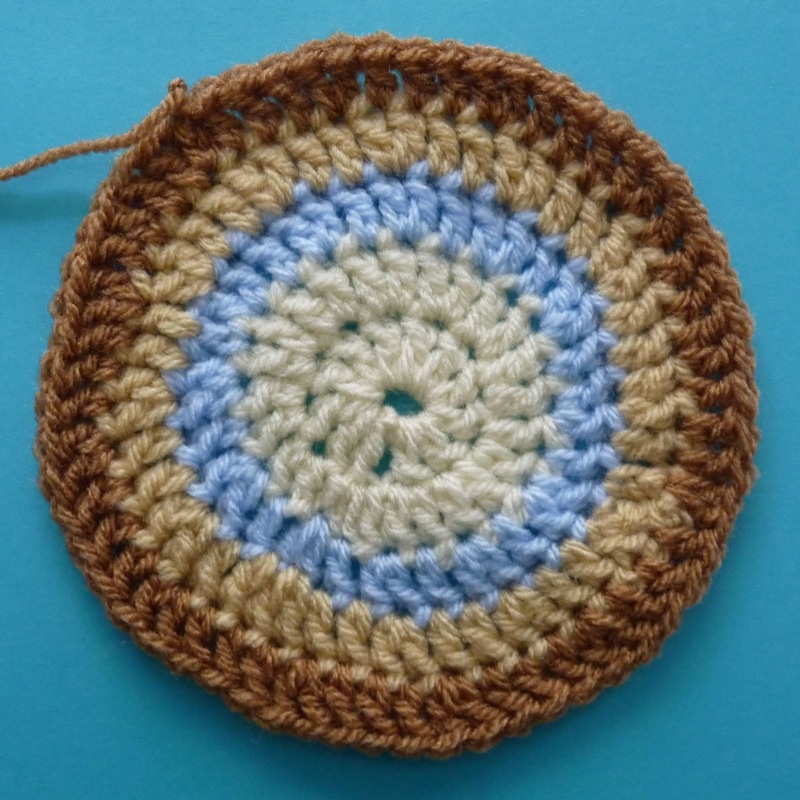 Join with slip stitch. You should now have 60 DC [TR] around your circle. Round 6: 1 ch, *2 TR [DTR] in same stitch. 1 DC [TR] in the next two stitches, 1 HDC [HTR] in the next two stitches, 1 SC [DC] in the next five stitches, 1 HDC [HTR] in the next two stitches, 1 DC [TR] in the next two stitches, 2 TR [DTR] in same stitch, 2 chain **. Repeat from * to ** three more times. Join with slip stitch to the top of the first TR [DTR]. Round 8: Repeat round 7. Leave a long tail to sew the motifs together.